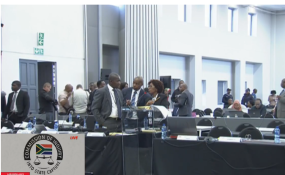 Video screenshot of the Zondo Commission of Inquiry (file photo). Hogan Lovells South Africa said it was appalled and shocked by allegations made by former Bosasa executive Angelo Agrizzi at the Zondo commission of inquiry on Thursday which linked one of the firm's former partners to Bosasa's corrupt payments to government officials. Agrizzi implicated Brian Biebuyck, a former lawyer at Hogan Lovells who left the firm at the end of March 2017, in his testimony before the commission. Biebuyck was implicated through a video showing Bosasa CEO Gavin Watson, former Bosasa chief financial officer Andries van Tonder, and Bosasa's head of security, director and chairperson Joe Gumede. Van Tonder and Watson appear to be counting stacks of cash. At one point, Watson tells Van Tonder: "Okay. What's going to happen here, Brian Biebuyck and Angelo will handle Patrick independently, okay?" "We are deeply disturbed by what was claimed yesterday before the commission. We strongly condemn all forms of bribery and corruption and our first priority is to understand for ourselves the events which are alleged by Agrizzi to have taken place. We will take the appropriate actions and will report any criminal conduct to the relevant authorities," said Nkonzo Hlatshwayo, chairperson of Hogan Lovells South Africa. "We are committed to upholding the highest standards expected in our profession and will take whatever action is required to ensure that we adhere to those standards," said Hlatshwayo. Bosasa's origins can be traced back to 1999, when it was called Dyambu Holdings. At the time, shareholders of Dyambu allegedly included ministers Lindiwe Sisulu, Nosiviwe Mapisa-Nqakula and Nomvula Mokonyane, National Assembly Speaker Baleka Mbete and former deputy director general in the National Intelligence Agency Girlie Pikoli, News24 reported. On Thursday, however, Sisulu's spokesperson denied that she was ever part of the company and called on Agrizzi to retract his statements and issue a public apology to her, EWN reported.